Rob Harrell first got really into cartooning as a fourth grader, growing up in Bloomington, Indiana. By the fifth grade, he was producing his own magazine called Freak Out. While largely a blatant rip-off of Mad magazine, it featured the adventures of two original characters: Henry the Cat and Bob the blob. Reviews were mixed. After a few years of seasoning, he created the syndicated daily comic strip Big Top, which from 2002 through 2007, telling the story of a dysfunctional group of circus animals in the animal-run Big Top Circus. Currently, he writes and draws the long-running daily strip Adam@Home, about the daily exploits of Adam Newman and his family. His first graphic novel, Monster on the Hill, was released by Top Shelf Productions in 2013. Set in a fantastical 1860s England where each town takes great pride in their local monster, the book tells the story of one Stoker-on-Avon and their less than impressive monster Rayburn. 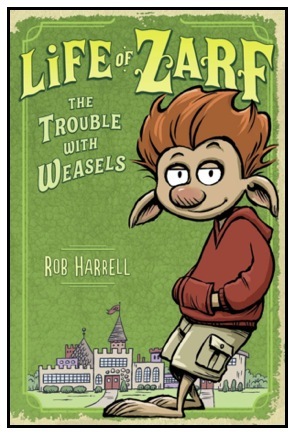 Rob is currently writing and illustrating a series of middle-grade books called Life of Zarf which tell the story of Zarf Belford, a troll just trying to make it through middle school in a fairy tale world. The first book was released in September 2014, and the second, Life of Zarf: The Troll Who Cried Wolf hit shelves in September 2015. 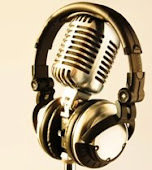 The third installment will be out in the fall of 2016. 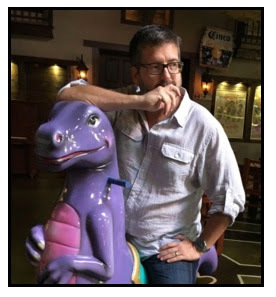 In addition to his busy schedule as an author and syndicated cartoonist Harrell is a freelance illustrator who has worked with clients that include Mad, Simon and Schuster, American Greetings, Time, Inc. and Volkswagen. His figurative paintings have been shown around the country, including solo shows in San Francisco, Austin and Indianapolis. Rob lives in Austin, Texas with his wife, Amber and their two dogs, Cooper and Kasey.